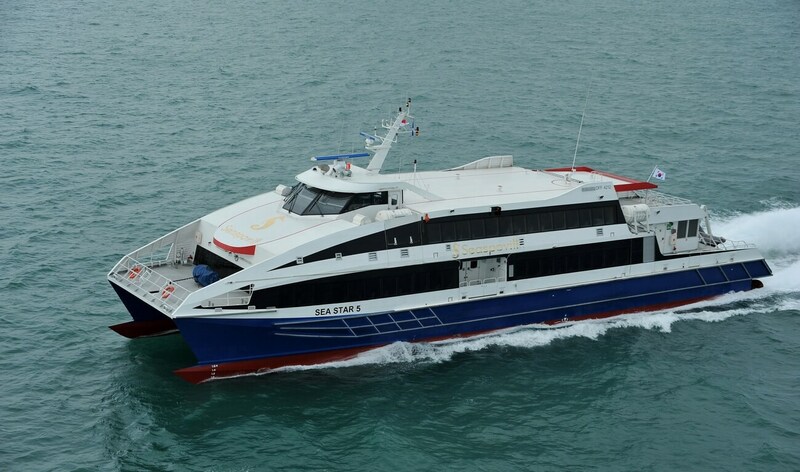 Home › Passenger Ferries › Fast Ferry › Damen Fast Ferry 4212 › Damen Fast Ferry 4212 "Seastar 5"
Seaspovill, the South Korean operator, took delivery of its second Damen Fast Ferry at a ceremony held at Damen Shipyards Singapore recently. Seaspovill approached Damen with the order for the Damen Fast Ferry 4212 as a result of the vessel’s efficient fuel consumption and excellent sailing performance. This is essential for the often-rough seas of the 80 nautical mile route: the ferry will transport up to 450 people between Gangneung on the east coast of South Korea and the island of Ulleung-Do.